How your personality affects the way you exercise! We all know that our personality traits (good or bad) affect our lives in many ways. 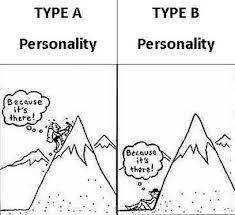 The jobs we pick, the friends we make, the spouse we choose, the social activities we are involved in are just some of the main areas that are affected by our personality types. The same goes with exercise. Our personality has a big influence on the type of exercises we choose and even how intense our workouts are. I recently read an article in Science Daily that discussed this very topic. After a study was done, researchers found that bold and assertive people tend to have higher aerobic capacities than their more demure counterparts. These findings also go along with personality traits and the longevity of life. “Go-getters” and energetic people do tend to live longer. Now, I don’t believe that biologically these different types of people are different. Less assertive types can be just as fit as anyone else. I think the key here is how certain personalities take on challenges. Bold, self- confident people thrive on these physical challenges and have enough self- esteem to take them on. Those with a lower self-esteem or perhaps even depressed may lower their expectations in their workouts b/c they feel they could not be as good as the person next to them. I must add in here that just b/c someone is shy does not mean they do not possess a bold “fitness personality”. They may not be the center of attention, but they possess the same confidence and ability to take on challenges on the gym floor. Perhaps these “quieter” people are even more focused while training. What I found so intriguing about this article is that once again our minds are more powerful than we give them credit for. The state of mind you have before you face a tough workout or any challenge is key to your success. For those who may struggle with confidence in the gym or with exercise in general, it may be a good idea to take a minute before you begin your workout and remind yourself not to let insecurities hold you back. Your success will mirror the effort you give your workouts. Go take on those challenges no matter what your personality is! The great thing about taking control of your fitness is it makes you realize that with enough hard work you can accomplish what seemed like the impossible. Now go be a “go-getter” at your next workout! Here is a link to the article I referred to earlier -worth a read!